Laurie Mahoney has been the Buffalo Games marketing manager since 2008 and considers herself the luckiest employee in the company. Recently, Laurie spoke to LoveToKnow about some of the company's popular games. Buffalo Games is an American company, based in Buffalo, New York, that makes fun and affordable party games, family board games and adult jigsaw puzzles. Started in 1986 by Paul and Eden Dedrick, Buffalo Games is now a company of 80+ full-time employees. I work with amazing people with bright minds who create, imagine and work really, really hard to bring truly fun and affordable products to the market. The Buffalo Games' mission is to make life more fun & rewarding- which is what we work to do, and I believe with our games and puzzles - we accomplish it! How does your company choose games to market? Our company receives 300-400 prototype games each year from all over the world. Game inventors submit their ideas, and we have a team in place that reviews the games and sees if they fit into our core system. For us to produce a game, it needs to be fun, affordable and have strong replay value. Our three favorite words are "Let's Play Again." We also have a team in-house who travels to various shows (industry shows, trade shows, licensing shows, etc.) during the year, meets with people to talk about ideas, and ultimately, narrows the field down to what is then brought to the executive team and the process begins. In any given year we can review up to 300 potential games and maybe only produce one or two games. We're very choosy about our games because we want our games to last and be played over and over. Many games on the market today are in and out very quickly - which is something we try our best to avoid. What games do you offer that are geared for older teens and adults? Our games are for everyone 14+ who wants to have a great time. Our light strategy game, Ruin, has an age range of 10+ as it has a more "mass appeal" not only to adults, but to children 10+ who wish for fun and adventure. This game is going to be fantastic! 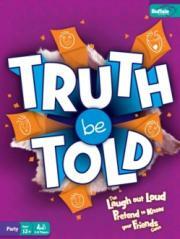 Developed by Buffalo Games, Truth Be Told is the "laugh out loud" party game where you pretend to know your friends. In the fourth quarter of 2009 we pre-launched this new party game in six key markets. In a 12 week period, we exceeded our sales goal by 150 percent, and the feedback we have received has been nothing but positive, from the media, board game meet up groups, people who have purchased and played the game and retailers. We are working very hard to spread the word about Truth Be Told. It's one of those games where if people play it at a store, they usually end up purchasing it. I haven't been this excited about a new game in a very long time. Why would this game be a great party game? Truth Be Told is a great party game because it gets people talking, first about themselves, which is always a little window into their character. Friends and family members who have played this game end up knowing more about each other than they did before. It's amazing what people will reveal about themselves, and the laughter that ensues after every round is contagious. What other games would you recommend for our readers? Likewise, T-Shirt Game, Ruin, Last Word and imaginiff, of course! Where can we read more about Buffalo Games? You can check us out at our web site Buffalo Games or our Facebook page "Buffalo Games." Our Facebook page has information/fan pages on all of our games - so there is something there for everyone. Where can readers purchase these games? Buffalo Games can be purchased nationwide at larger retailers such as Walmart, Target, Kmart, Toys R Us, Barnes & Noble, Borders, as well as mid-tier retailers (i.e., Meiger, Fred Meyer, etc), in malls at Calendar Club, Books-A-Million, and at specialty stores throughout the U.S. and Canada. Our products are also sold through online retailers like Amazon and Walmart.com, as well as through our website.